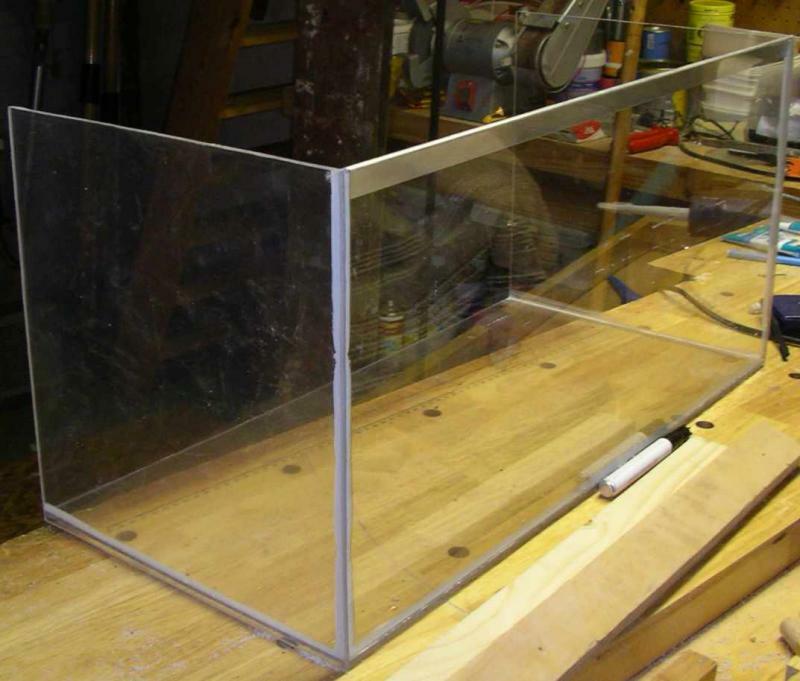 I have a black polyester tank, and I'm using lexan and acrylic glass to construct two smaller tanks and covers. 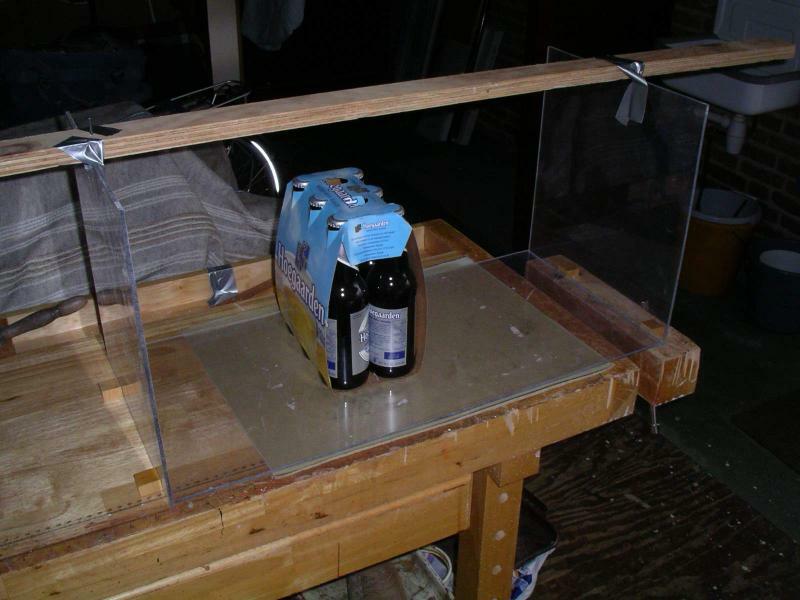 Lexan & Acrylic glass are much lighter than glass and easier to work with. Lexan is a strong and light material, but unfortunately it is opaque to UV-light (<285 nm wavelength. For this reason Lexan is used for making camera lenses.) 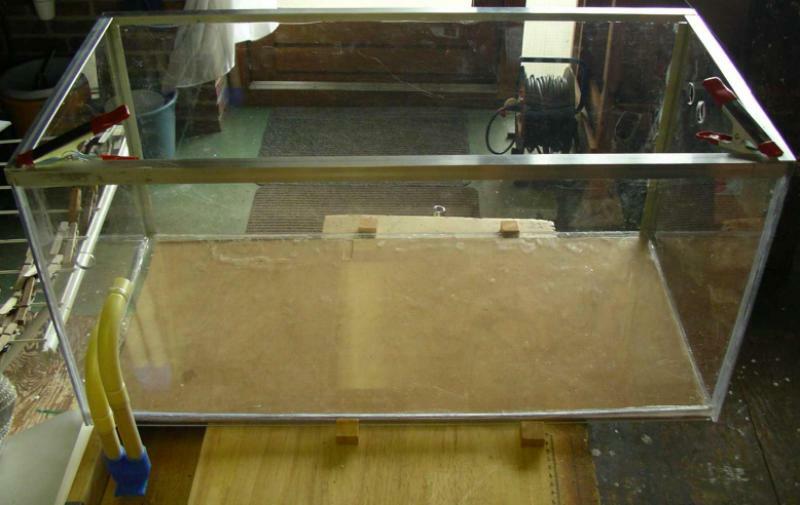 Acrylic glass is UV-transparent but more flexible. So I'm using Lexan for solidity & acrylic glass for UV-light. There is a polyester tank filled with water, 120 x 80 x 35 cm, with a large diagonal lid, to allow condensed water to flow back into the tank. 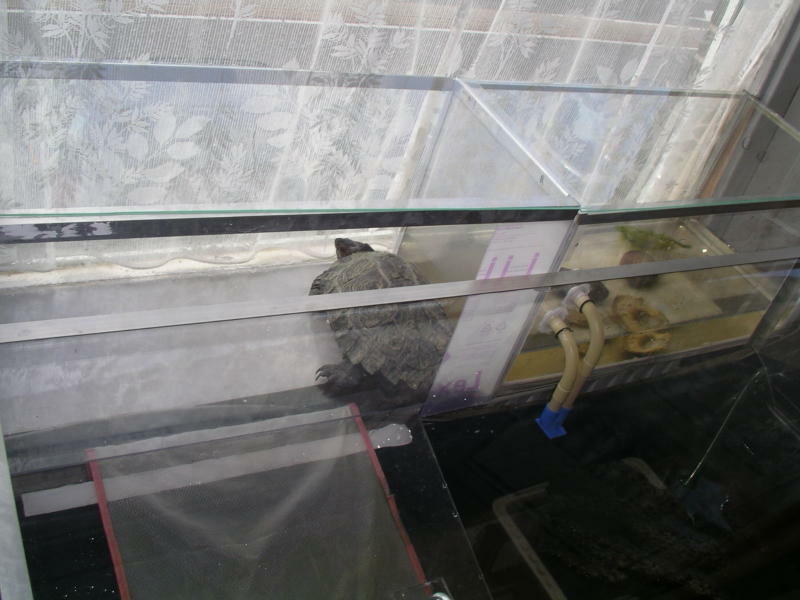 I have chosen an opaque material for the tank, because I have the impression that glass confuses turtles. They will always try to swim through it. There are stones & wood in the tank, but no plants because Giant Asian pond turtles make a mess of them. They even try to eat plastic plants! 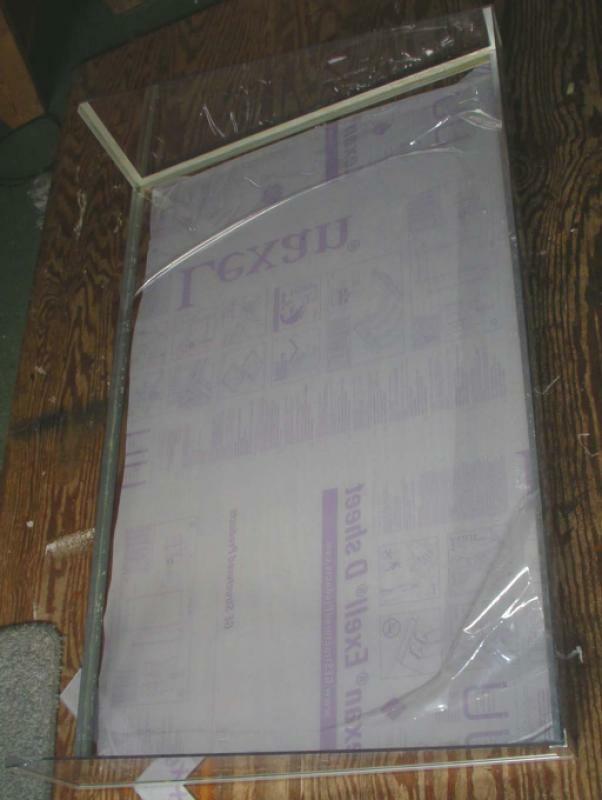 The cover is made of Lexan, and light enough to remove it easily. There are two smaller tanks, both 65 x 35 x 30 cm. 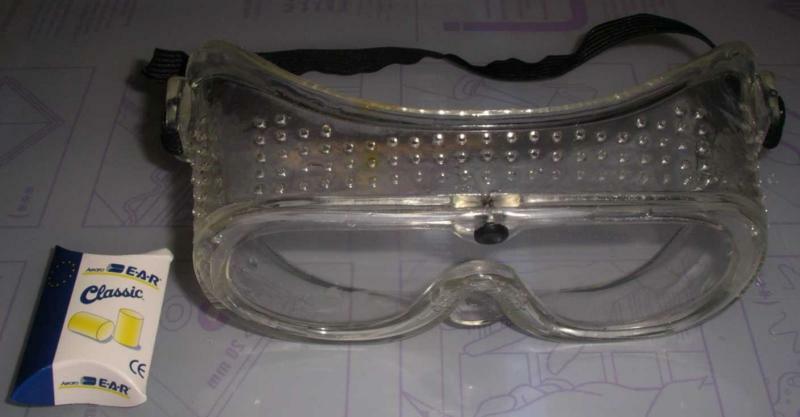 They're made of lexan; except the sides facing the sun & the lids, which are made of acrylic glass to allow uv-light to pass through. 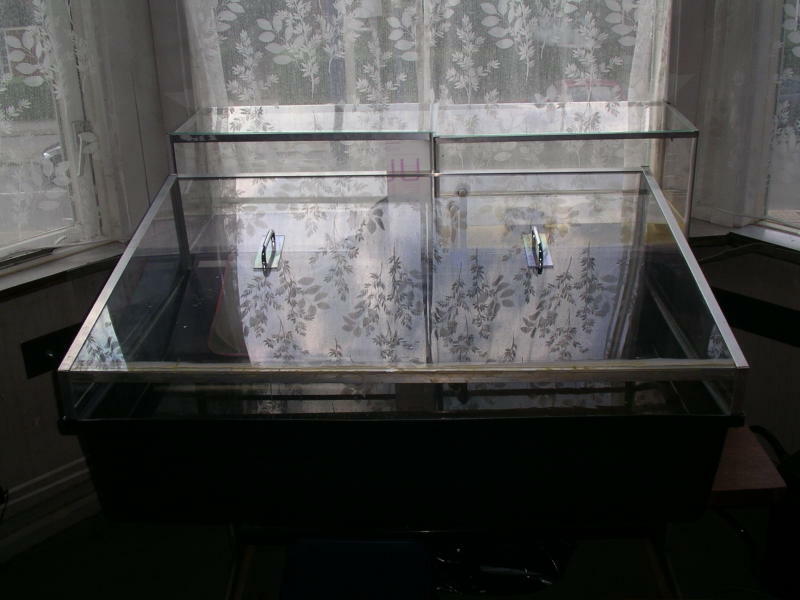 The left tank is a basking enclosure which is connected to the polyester tank with a bridge. The right tank is a biological filter which is inaccessible to the turtles. I use two Eheim filters to pump water into one side of the filter tank. On the other side it flows back into the polyester tank. The filter tank contains zebra mussels and aquatic plants in pots. I have good experiences with zebra mussels as water filters. The smaller tanks are next to a window, and are exposed to full sunlight most of the day. The polyester tank is behind them on a lower level, and connected to the basking tank with a bridge. The entire structure is heated. This setup is modular and flexible. In the future I will add more units to it, e.g. an egg-laying area. Please let me know what you think of this setup. The construction is only half-finished; I can still make adaptations. So, while filtration by mussels may be a very useful addition to a filter system, please be careful to dispose responsibly of surplus mussels AND tank water that could contain mussel larvae - feed the mussels to the turtles, and use the water for houseplants or garden plants in such a manner that it soaks into the ground and cannot run into open water. We have nearly finished constructing the new turtle enclosure, according to the design described before. The constructions are reinforced with aluminium profiles. the cover plate. 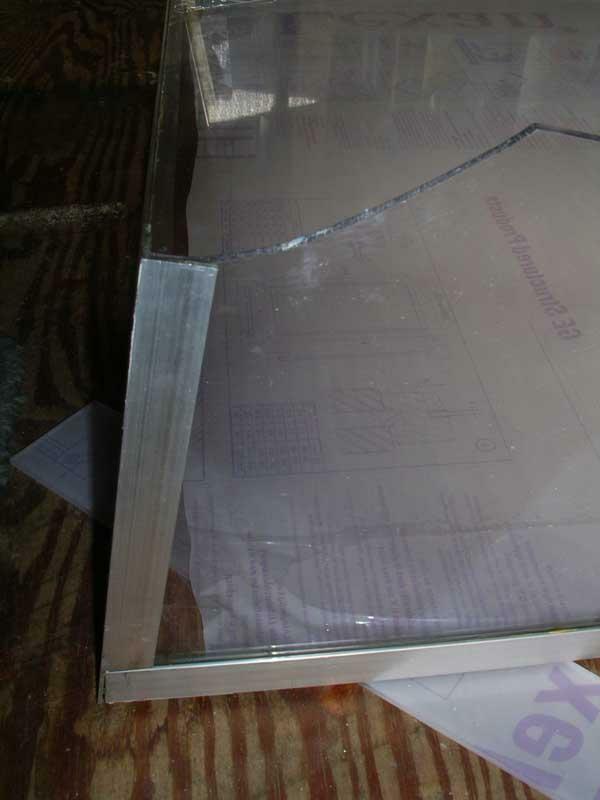 One of the advantages of lexan is that it's much lighter than glass. I could not lift a glass plate of this size on my own. Here is another update on my enclosure. At the moment the filter tank, on the right, is inhabited by swan mussels (Anodonta cygnea), guppies (Poecilia reticulata), snails (Planorbis planorbis & others), aquatic sowbugs (Asellus aquaticus) & aquatic plants. Now and then I pump water into this filter tank. The plants and animals in it clean the water - at least theoretically. The water flows back into the black tank. The temperature in the enclosure is above 20C all year round. In the near future, I will install lights in it and build a larger turtle platform. I'm also looking for a small water pump to pump water into the filter tank continuously. My Eheim 2215 is too strong for this purpose. The enclosure is working out very well, but there was an unexpected complication: my grandises can't get along anymore. The male has become very aggressive towards the female. And the only solution was to build yet another enclosure. This new enclosure is nearly finished too. I will soon start a new thread about it. Forgive me if it's not ok to dig up old posts, but I really like your enclosure, Marnix! Nice job! NICE! I have never done a natural filter system like that with the mussels and stuff, I would like to. Can you give me any tips? Another tip I can give is not to use freshwater mussels at all because they don't last very long.